As the school year ends I think of all the kids that will be home for the summer and a parent’s need for fun budget-friendly activities for kids. 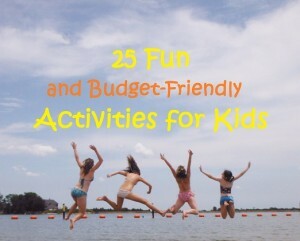 Every year I get my younger (7 to 16 years younger) sisters for a week during the summer, and a few weekends throughout the year, and every time I need activities to keep them engaged instead of sleeping all day or saying, “I’m bored.” Here are 25 fun and budget-friendly activities for kids, which I have used for all age levels. Visit a state park. State parks are very budget-friendly and offer a variety of things to do. The most it has cost to get into a park was $3 for parking, or $20 for camping. We even found a park near Monroe, La for $1 per day. You can fish, swim, go hiking, look through the visitor’s center, take nature tours the park rangers provide, and some parks have boat rides and rental areas (paddle boat, kayak, and canoe). Go to the zoo. A family can spend an entire day at the zoo, just remember to pack your lunch and only take pictures for souvenirs to save money. Go on a safari. Drive through safaris can be cheaper than visiting a zoo, plus they are more interactive. Most drive through safaris offer a petting zoo and food to feed the animals from your window. Collect scrap metal. I know, you are wondering how that is going to entertain your kid. Well, it works for my sisters. We happen to have access to land that has a lot of scrap metal buried in the dirt, but if you don’t you can always take a walk and collect cans as you go. This not only cleans up pollution, but you can turn the scrap metal in for money and give your child a portion for their help. Target practice. Target practice can be a fun way to work on hand-eye coordination. This can be done with your choice of equipment (archery, shooting, darts, sling shot, airsoft, throwing bouncing balls, etc.) Make sure you go over safety and handling rules with all target practice items. Have a beauty day. Make homemade body scrub and moisturizer, use the beauty products on each other, give massages, soak your feet in Epsom salt, and give each other manicures and pedicures. Make crafts. 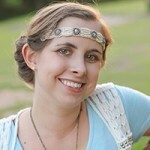 Make paracord bracelets, key chains, gun slings, or dog collars; decorate plain headbands with ribbon or buttons, use beads, buttons, and twine to make bracelets; learn to crochet or knit. Puzzles. Instead of just putting a puzzle together have puzzle races or do group puzzles within a time limit. You can also make your own puzzle (glue a picture onto cardboard and cut out the design). Game day. You can play a variety of board games, card games, or active games, like hide and seek, freeze tag, Simon says, etc. Have a scavenger hunt. You can give clues to find the next item, or you can have a list of items that need to be found – great for a nature hunt or at the mall (take a picture of the item, so you don’t have to buy it). Go swimming. There are many free swimming spots at local lakes or at a park. Go on a picnic. I actually recommend this one any time you leave the house for a fun activity (even if it is in the back of your car). Go fishing. Before fishing make sure you check your state’s regulations and teach your child how to safely handle a fishing pole and hook. Go camping. You can go camping at a state park for a small fee, in your back yard, or in the woods (make sure you have permission of the owner). Campfire cooking. I love cooking outside, especially on a campfire. This can get everyone involved on building the fire, preparing the food, and making dessert (smores!). Go to the movies. I recommend going to the movies in the morning, this is when prices are lower. And skip out on the popcorn and drinks, sneak in your own snacks if you must. Go to a museum. Check the schedule online for rates and ways to save. At the museums of Fair Park in Dallas we were able to get into 3 museums for the price of one by going on a Tuesday. Work on your photo albums. This gives you and the kids a chance to reminisce and organizes your collection of photos. Take a walk or hike. This can be done around your neighborhood, at the track, or at the local park. Have a mud bath. Ok, this might not be for all adults, but you would be missing out on a great skin treatment. Put your swim suits on, find a mud hole/or make one, and have fun covering each other in the wet dirt and making mud pies. Tip: Rinse off with a water hose and have a towel for each person to scoot across the floor with until they get to the shower. Bake or cook from scratch. Make cakes, cupcakes, pies, and different meals from scratch. Try a new recipe. Have an obstacle course race. Use pillows, blankets, chairs, clothing, eggs, spoons, and anything else you can think of to race around an obstacle course and have challenges to do (like put on and take off dress up clothes, or balancing an egg on a spoon). Decorate windows. Crayola has widow markers. They are washable, but allow kids to draw whatever they want on a window. Make presents for hospital patients. You can make cards, cookies, sock puppet dolls, gift baskets, and more for hospital patients (you might call the hospital to ask for suggestions and rules). Have a water fight. Use water guns, a water hose, and water balloons to get each other soaking wet. 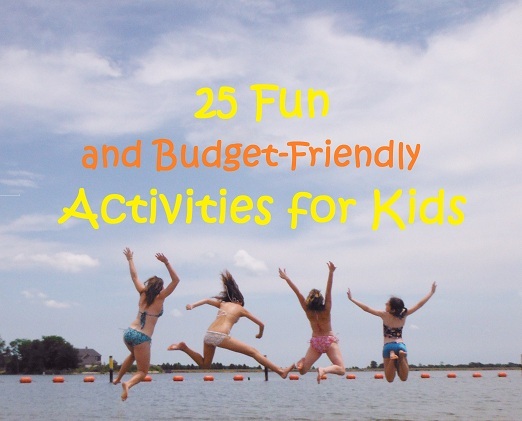 I could keep going, but I think I’ll just stop with 25 fun and budget friendly activities for kids. What are some of your favorite activities you do with your kids? I just read the article. Thank you so much! Kenny get’s out of school soon, i’m going to knock out everyone of those with her this summer. She will love it! Great! I hope Kenny and you have fun. Let us know if you find any other budget-friendly activities you two enjoy.